Zoom espanol is an inspiring two-part Spanish course offering fresh, exciting material and a fully-integrated video drama for the full ability range at KS3. There is a clear route through for students following both two-year and three-year courses so students and teachers know exactly how much material needs to be covered. Zoom espanol delivers the revised KS3 Programme of Study, PLTS and the Renewed Framework. The Zoom espanol course has a full suite of differentiated resources to support your needs: Student Books, Teacher Books, Foundation and Higher Workbooks, Audio CDs, Interactive OxBox CD-ROM and Assessment OxBox CD-ROM. 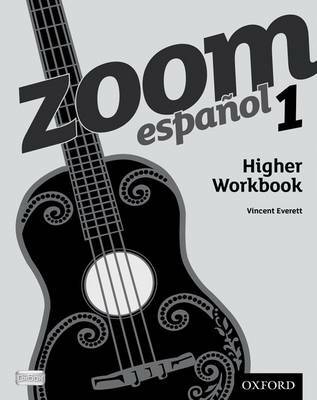 The Zoom espanol 1 Higher Workbook is full of extra listening, reading, writing and speaking material to extend the grammar, topics and skills learnt in the Students' Book. The Higher Workbook is ideal for homework and further practice either during or outside of lesson time.